Nawaz: Was Sharif’s Visit a Success? Shuja Nawaz, director of the South Asia Center, joins WAMU’s the Diane Rehm Show to discuss the legality of US drone policy. Pakistani Prime Minister Nawaz Sharif is meeting with you on Wednesday with high expectations. He is a pragmatic business-oriented politician with a powerful electoral base who has shown magnanimity and deftness in allowing opposition parties to form governments in Khyber-Pakhtunkhwa and Sindh provinces, and he backed the election of a nationalist Baloch as the chief minister in Baluchistan. While this could be seen as a policy of sharing the misery of trying to govern an ungovernable Pakistan, it could also be an attempt to work within a fractured political system. Regardless, he represents a chance to provide continuity for civilian governance in Pakistan and to build a relationship that goes beyond our immediate need to exit Afghanistan gracefully. On Afghanistan, his advisors, both civil and military, will have told him that we need them badly; Pakistan tends to overestimate its leverage on such security issues. You will have likely been told by many yourself that we can get the Pakistanis to yield, if only we tighten the screws on them — militarily via our aid program and the use of drone strikes, and economically via threats to withhold assistance directly or from international financial institutions. We already have some credit on the latter. Pakistan has a new loan package with the International Monetary Fund, that we supported, though it remains to be seen if they will be able to deliver on the tough policy shifts they have to make to sustain the loan. This type of international financial support is an easier way for us to help or squeeze Pakistan without bringing Congress into the game. As for the game itself, we can play the short game, focusing primarily on Afghanistan. In that case, making smoother payments from the Coalition Support Fund, and replacing Pakistan’s heavily-used military materiel will help. Closer collaboration in helping them target their local Taliban fighters would also win points and cooperation. Or, we could go for the long game and broaden our influence beyond the central government to the business community and the people of Pakistan. Large numbers of Pakistanis hate the United States because they have seen us support unpopular leaders, both civil and military, in the past. Sharif, a popular and business-oriented leader, appears to have the right instincts on a number of issues. He favors trade over aid, and he favors open borders with his neighbors. We could directly assist him by lowering the tariff rates on Pakistani imports, especially those on textiles — at least to the level of European countries which have already given Pakistan that concession. Call it a level-playing field. At worst, you will lose South Carolina. But we will bring the emerging and powerful Pakistani business community to our side. In turn, it will help Sharif make the case domestically for open trade with India. You could also use quiet diplomacy with India to help it work things out with Pakistan on trade and border issues while waiting for the next Indian elections in spring 2014. We also have a substantial proportion of the Kerry-Lugar-Berman funds that have not yet been disbursed and though that aid program ends next year, you could extend it for another two years without seeking additional monies and thus use the full $7.5 billion that has been allocated. Though this is not a huge amount when compared with Pakistan’s needs, the symbolic value would be substantial. Currently, Sharif is personally running the foreign, commerce, and defense ministries –- a tall order for any prime minister. But it allows us to deal with him on a wide range of issues at the highest level. His energy ministers are already working with our key officials and even intelligence collaboration exists, regardless of the underlying mistrust. If we can avoid looking for an obvious quid pro quo in the short run, we may be able to help the Pakistanis also play the long game. In short, we may be able to do business with Sharif. Recall that he did help President George H. W. Bush with Somalia in the early 1990s. You will have only a short time with him on Wednesday. Instead of having him recite his grievances, it might be better to have him define a path for the future that helps both countries, and offer to help strengthen his position at home as a result. He will get that. You do not get to be prime minister of Pakistan for a record third time without such smarts. Trust him. But tell him you will verify his moves once he gets home. 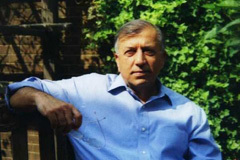 Shuja Nawaz is the Director of the South Asia Center at the Atlantic Council in Washington, D.C., and is the author of Crossed Swords: Pakistan, Its Army, and the Wars Within. When Pakistani Prime Minister Nawaz Sharif lands in Washington this weekend, he would not be blamed if he is wracked by mixed feelings. His last visit to the US capital, in July 1999, occurred in the wake of the Kargil adventure with India that he allowed to get out of hand, and which led to a break with his army chief and his eventual ouster as prime minister. Due to the coup by Gen. Pervez Musharraf, Pakistan was in the political doghouse until the then-president became a US ally in the wake of the terrorist attack of 9/11 and the allied invasion of Afghanistan. For over a decade, Musharraf played the Afghanistan and terrorism cards to his advantage, while his own country slid into the depths of militancy and terrorism. Ironically, he never visited his own troops who were fighting and dying inside the border region. Neither did most of Pakistan’s civilian leaders. Sharif promised a change toward more active democratic governance when he took over after the May 2013 elections, but his tenure has had a slow start. If he is to make a difference, he will need to show much more alacrity, planning, and boldness in his dealings at home and abroad. He comes to Washington, a place that Charles Dickens once called city of “magnificent intentions,” though a number of realities will challenge him both during and after this visit. First, Washington is distracted at home by its recent budgetary battle and government shutdown. Abroad, Syria and Iran have stolen the attention of policymakers and lawmakers alike. The good news is that Pakistan is not on the front burner. But the bad news is also that Pakistan is not on the front burner. Sharif will, at best, meet a polite reception, but it is unclear what big issues bring the two countries together, while many issues potentially threaten this tenuous relationship. The impending coalition exit from Afghanistan is a short-term issue. A stable and prosperous Pakistan is what will matter most for the long run. Sharif needs to resist the temptation of showing how important he is to the Americans. If he is strong at home in governing and delivering on the promise of democracy, he will carry greater weight abroad. Second, Sharif has yet to establish clear civilian control over the military. His tentative steps in handling the upcoming changes in the military’s leadership leave more questions on the table than answers. Exercising his constitutional prerogative to appoint military commanders is critical, but so is the timing of those actions. Army chief Gen. Ashfaq Parvez Kayani gave him an opportunity by publicly announcing that he would in fact be stepping down at the end of November. Sharif muddled that opening by delaying the naming of the next chairman of the Joint Chiefs of Staff and the Army chief. What lessons will the Americans draw from this? Most likely that they must continue their military-to-military relationship as the dependable cornerstone of the current engagement with Pakistan, at least until they exit Afghanistan next year. Third, despite Pakistani claims of victory when the United States agreed on Friday to pay $322 million worth of arrears of Coalition Support Funds (CSF) to Pakistan, the future is uncertain. Pakistani Finance Minister Sen. Ishaq Dar, during his recent visit to Washington to attend the annual meeting of the International Monetary Fund and the World Bank, said he had taken up the issue of CSF payments with US State and Treasury Departments and they had assured him that payment would be made soon. But the reality has been obfuscated by that cheerful announcement. CSF payments will cease at the end of 2014. Currently, there are no US plans to support Pakistani military operations beyond next year. Furthermore, no payments will be given to Pakistan for the period when the Ground Lines of Communication with Afghanistan were closed. So forget about those seven months. And US authorities have laid down new rules, meaning that the previous claims for expenditures outside the border region and unrelated to military operations will no longer be entertained for reimbursement. In effect, roughly a third of the previous claims will not be paid. The only bright side is that claims will now be paid on a quarterly basis at the potential rate of roughly $100 million a month. Fourth, Pakistan has not shown many signs of ground work in Washington since the Sharif government took over. Not on the Hill, nor with the administration. Even the prime minister’s own visit was not preceded by high-level preparation. And there is no Pakistani ambassador in town, as yet. All of this leads one to believe that no major issues will actually be discussed or resolved. Afghanistan will loom large. India may be raised. But the United States has its own India agenda that does not always include Pakistan. Congress will likely want to know what will happen to Dr. Shakil Afridi and to Musharraf. Will Sharif be able to provide a clear set of answers? Pakistan needs a new and clear strategic overview of its region and global relationships. It cannot lurch from crisis to crisis, nor can it rely on the global fear of its nuclear arsenal falling into the wrong hands to be the excuse for aid to a country that has not clearly defined its domestic or foreign policy. It faces a huge domestic terror threat. It needs to open its borders to its neighbors and to trade across the region. Sharif has an opportunity to boldly and unambiguously state where he stands on these issues. If he does so in Washington, he may mark an early turning point in his tenure. Ambiguity and business as usual, however, will not do. When Pakistani Prime Minister Nawaz Sharif lands in Washington this weekend, he would not be blamed if he is wracked by mixed feelings. His last visit to the U.S. capital, in July 1999, occurred in the wake of the Kargil adventure with India that he allowed to get out of hand, and which led to a break with his army chief and his eventual ouster as prime minister. Due to the coup by Gen. Pervez Musharraf, Pakistan was in the political doghouse until the then-president became a U.S. ally in the wake of the terrorist attack of 9/11 and the allied invasion of Afghanistan. For over a decade, Musharraf played the Afghanistan and terrorism cards to his advantage, while his own country slid into the depths of militancy and terrorism. Ironically, he never visited his own troops who were fighting and dying inside the border region. Neither did most of Pakistan’s civilian leaders.